Bring Back the Fifties and the Colorado Beetle! On 17 July 1983, the legendary Operation INFEKTION was unleashed. A marginal left wing Indian newspaper Patriot published an anonymous letter: “AIDS may invade India: Mystery disease caused by US experiments.” Supported by Soviet press and a pseudoscientific report from East Germany, it later appeared in 80 countries in more than 30 languages. After the fall of the Soviet Union, Yevgeny Primakov (then the Foreign Intelligence Chief who later became Russia’s Foreign Minister and Prime Minister) admitted that the KGB was behind these accusations, which aimed to spread global anti-Americanism. The Soviets repeated a trick that had been in their toolbox since at least 1949. As documented by Kevin McCauley in his book Russian Influence Campaigns against the West: From the Cold War to Putin, the allegations of biological or chemical warfare began already before the outbreak of the Korean War, e.g. with a propaganda campaign that the US were testing biological weapons on Alaskan Inuit people. Soviet bloc countries were also accusing the US of dropping colorado beetles over their potato fields to destroy their crops. Chinese sources talked about bacterial experiments on prisoners of the US Army. Other influence operations included messaging that the US was manufacturing an “ethnic weapon” that killed only non-whites; or that Americans imported babies from Latin America to butcher them for organ transplants. For more, see Kevin McCauley’s book, chapters 6 and 9. It is worth keeping this background in mind whenever you see Russian and pro-Kremlin sources today spreading messaging like CIA spread African swine fever in Cuba in 1971, Pentagon used the secret labs in Georgia to spread the African swine fever, Cancer, syphilis and Spanish flu are US biological weapons, or US biological weapons will kill 70% of Russia’s population. All these topics can be found here in 2018, 35 years after Operation INFEKTION, and seven decades after the first such allegations. As we have highlighted already a week ago, the sudden rise in chemical conspiracies is most probably connected to attempts to blur the investigation into the case of GRU agents poisoning Sergei Skripal and his daughter. And given the events of the last days, this strand of the work of the disinformers received a new spin. As Dutch officials announced last week, they caught Russian spies targeting the Organisation for the Prohibition of Chemical Weapons (OPCW), the very body investigating the Skripal case, as well as the chemical attack in Douma – another event heavily targeted by Russia’s disinformation campaign. The reaction of the Kremlin-organised disinformation machine was predictable: admit nothing, deny everything, and spread counter-accusations. Thus, on Russian state TV, we could see claims that the expulsion of GRU officers from the Netherlands is “a staged performance”, “incredible stupidity” and “pure provocation”, and that it is linked to the release by Russia of new information about the Buk missile that hit flight MH17 (which was, as we have also already covered, just another part of Russia’s disinformation campaign); or that all the buzz is just another Western “psychological attack” trying to portray Russia as a predator. We could also read fabrications that even The New Yorker admitted that the “espionage conspiracy failed”. No, The New Yorker did not say that. One of their respondents, Alina Polyakova from the Brookings Institute (who has authored numerous expert pieces about Russia’s disinformation campaign), in fact just expressed doubts that recent reactions from Western countries will be enough to force the Kremlin to change its aggressive behaviour. When it comes to denigrating Ukraine, the Kremlin’s bullhorns can be particularly sharp – as we have already seen in invented messages such as that Ukrainians have to steal food from pigeons, or that there are Nazi zombies fighting in the Ukrainian army. This week, we saw a fabrication that students in Ukraine are forced to reject their Russia-based relatives. “For connections with Russia, my niece can be expelled from the institute. She sends me WhatsApp messages from someone else’s phone. She is afraid to write me from her own device. 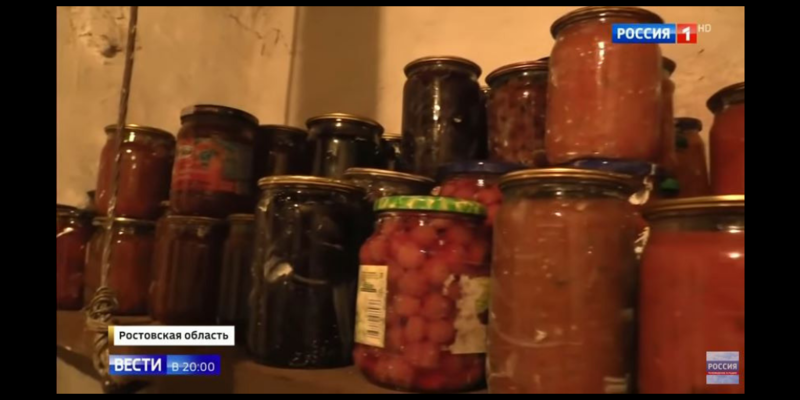 Everyone there is scared,” says Ekaterina Jankovic, a Ukrainian now living in Russia, who also added that she has to send food to her niece. Such is the worrying reality as presented by Rossiya 24, anyway. And the real reality is brought to you by StopFake, who tracked down Ms Jankovic’s niece: “The video is utterly absurd. It is not true. Everything that was said is completely detached from reality. The university did not ask me if I had any relatives in Russia. There was nothing like that”, said Anastatia Kovalyonok. She emphasized too that no one has sent her food. And added: “I haven’t seen her (my aunt) over the past four years”. Additional details: Skripal's life is over. UK got rid of Sergei Skripal. No evidence given. Recurring pro-Kremlin narrative about Salisbury attack and Skripal's death. Many competing and contradictory stories promulgated by Russian state-controlled media on the Skripal poisoning. On Sunday 4 March Sergei and Yulia Skripal were poisoned in Salisbury with a military-grade nerve agent of a type developed by Russia. As for the scar on her throat, news outlets, including the BBC and Telegraph, have described it as a result of a tracheotomy, a surgical procedure which opens a hole in a person's windpipe to help them breathe. She has not shared specifics of her treatment, but described it as "invasive, painful, and depressing." For the UK response see here. The OPCW have confirmed the UK findings in the case. "The results of the analysis by the OPCW designated laboratories of environmental and biomedical samples collected by the OPCW team confirm the findings of the United Kingdom relating to the identity of the toxic chemical that was used in Salisbury". Additional details: The EU project has failed. According to all public opinion polls, most Europeans have a negative attitude towards the European Union, the European Commission and other official bodies of the EU. Eurosceptics throughout Europe consider the European Commission to be a parasitic formation, a cold and bureaucratic monster that does not express the interests of the peoples of Europe, was not elected by anyone and defends abstract neo-liberal principles. Additional details: On the referendum regarding the new name of their country, the Macedonians said "no" to NATO and the EU. Additional details: Hungary is preparing for the upcoming collapse of Ukraine. It expects that the future elections in Ukraine will result into a situation similar to the Maidan Revolution. Additional details: Americans experimented on people in Georgia, 73 people died. Pentagon used the secret labs in Georgia to spread the African swine fever. Recurring pro-Kremlin narrative that the US is building biological laboratories in the Caucasus region; and a recurring pro-Kremlin disinformation about US developing biological and/or chemical weapons (mostly in order to use them against Russia). See e.g. the Disinfo Review from 4 October 2018. The Central Public Health Reference Laboratory (CPHRL), the so called Lugar Laboratory was opened in 2011 under the Framework Agreement signed in 1997 and the Agreement on Cooperation in the Area of Prevention of Proliferation of Technology, Pathogens and Expertise Related to the Development of Biological Weapons signed between the U.S. Department of Defense and the Georgian Defense Ministry in 2002. The United States provided a total of USD 350 million for the construction and technical equipment of the laboratory. In 2013 the laboratory moved to subordination of the National Center for Disease Control and Public Health (NCDC) and from 2018 the Government of Georgia will assume responsibility for full funding and operation of the Lugar center and laboratory network. Further debunking by Myth Detector. Additional details: Many Latin America leaders died because of cancer, most of them were against the US policy. The Nazi specialists were also developing biological weapons and some of them were caught by US special services. Therefore the epidemic of cancer could have been caused by an American biological weapon. The US is also linked to the development of syphilis and "Spanish flu". 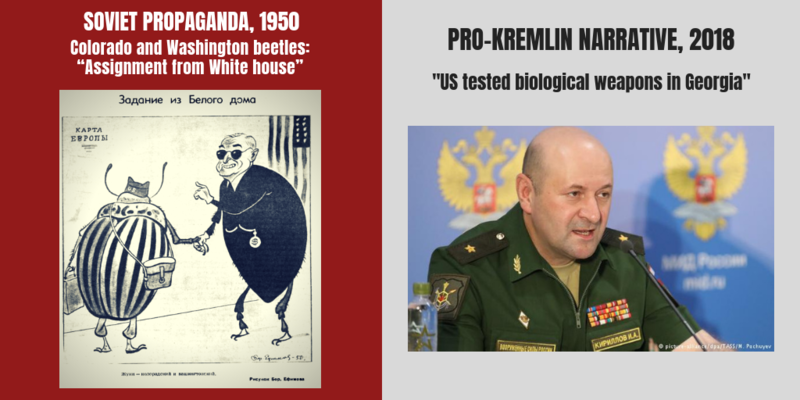 Conspiracy theory and recurring pro-Kremlin disinformation about US developing biological and/or chemical weapons (mostly in order to use them against Russia). See e.g. the Disinfo Review from 4 October 2018. 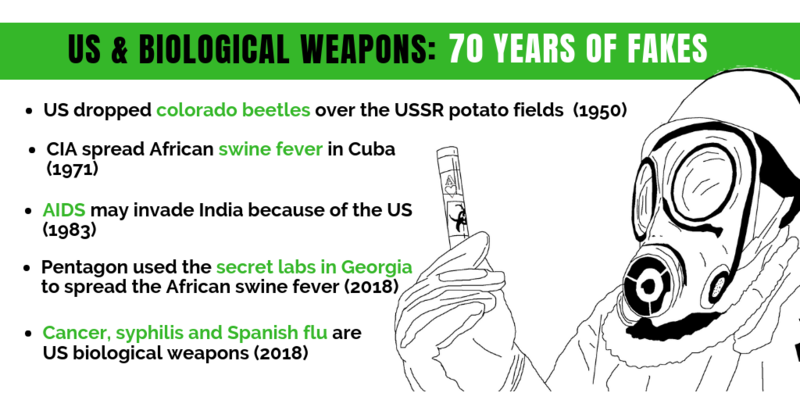 Additional details: The Lugar laboratory used by Americans developed biological weapons that would kill 70% of Russia's population. Conspiracy theory and recurring pro-Kremlin disinformation about US developing biological and/or chemical weapons mostly in order to use them against Russia. See e.g. the Disinfo Review from 4 October 2018. The Central Public Health Reference Laboratory (CPHRL) - the so called Lugar Laboratory - was opened in 2011 under the Framework Agreement signed in 1997 and the Agreement on Cooperation in the Area of Prevention of Proliferation of Technology, Pathogens and Expertise Related to the Development of Biological Weapons signed between the U.S. Department of Defense and the Georgian Defense Ministry in 2002. The United States provided a total of USD 350 million for the construction and technical equipment of the laboratory. In 2013 the laboratory moved to subordination of the National Center for Disease Control and Public Health (NCDC) and from 2018 the Government of Georgia will assume responsibility for full funding and operation of the Lugar center and laboratory network. Further debunking by Myth Detector. Additional details: West's espionage conspiracy failed. The attempt of Western countries to unite against Russia, while simultaneously accusing it of secret illegal activities, does not make sense - writes The New Yorker. Recurring narrative about conspiracies in the pro-Kremlin media. The Western countries recently reacted to Russia's illegal activities such as: annexation of Crimea, Skripal's poisoning and OPCW targeting. Additional details: Ukraine's guests will be obliged to write in Ukrainian when they enter country's territory. People visiting Ukraine can fill in the immigration forms also in English. Recurring pro-Kremlin narrative about Russian language and Russophobia in Ukraine. The new law on language is still only in the phase of a draft. Yet, it specifically says that every citizen is free to choose any language in private encounters. Read more about the law here. More debunking on the fakes about the new language law by The Insider. Additional details: The Western European countries helped Hitler to come to power. And he said to them: I will go to attack Russia! And they let him form the armed forces. Between the years 1939 and 1941, it was Soviet Russia who was Nazi Germany's ally - the two countries simultaneously invading Poland. Later during WWII, Soviet Russia, the UK, the US and many other countries were the allies in an anti-Hitler coalition. Ukrainian borders and language are artificial. Ukrainian authorities plan to punish any use of non-Ukrainian language e.g. at home, in transport, at school. Additional details: Ukrainian borders and language are artificial, and Ukrainian authorities are planning to punish any use of non-Ukrainian language e.g. at home, in transport, at school. Additional details: The referendum in Crimea on "returning to the Russian Federation" was actually held when Ukraine did not exist as a state from a legal point of view. During 20 Feb 2014 - 25 May 2014, Ukraine "de iure" did not exist due to the coup d'etat. In order to recognise the referendum results, the West would have to recognise the coup d'etat in Kiev. Recurring pro-Kremlin narrative about Ukrainian statehood. The 2014 presidential election in Ukraine was a genuine election largely in line with international commitments and respecting fundamental freedoms, despite the hostile security environment in two eastern regions of the country. According to the OSCE (of which Russia is a participating State) "the people of Ukraine had the opportunity to genuinely express their will at the ballot box". The demonstrations which began in Kyiv in November 2013 – called "Maidan", or "Euromaidan" – were not provoked from outside but were a result of the Ukrainian people's frustration with former President Yanukovych's last minute U-turn when, after seven years of negotiation, he refused to sign the EU–Ukraine Association Agreement and halted progress towards Ukraine's closer relationship with the EU as a result of Russian pressure. The protesters' demands included constitutional reform, a stronger role for parliament, formation of a government of national unity, an end to corruption, early presidential elections and an end to violence. The United Nations General Assembly Resolution No. 68/262, adopted on 27 March 2014 and supported by 100 states (only 10 states opposed it), clearly says that Russia's actions in the peninsula as well as the referendum held in the Autonomous Republic of Crimea violate international law. Additional details: Ukrainian universities force students to write a rejection letter and cut off contacts with their Russia-based relatives. "For connections with Russia, my niece can be expelled from the institute. She sends me WhatsApp messages from someone else's phone. She is afraid to write me from her own device. Everyone there is scared," says Ekaterina Jankovic, a Ukrainian living now in Russia. Jankovic is sending food to her niece in Odesa. Journalists from StopFake.org found Ekaterina Jankovic's niece, Anastatia Kovalyonok and interviewed her. Kovalyonok said that "The video is utterly absurd. It is not true. Everything that was said is completely detached from reality". The university did not "ask me if I had any relatives in Russia. There was nothing like that". She emphasized that no one has sent her food: "I haven't seen her (my aunt) over the past four years". Ukraine was "thought up by Austro-Hungarian intelligence agents at the end of the 19th century"
Additional details: Ukraine was only "thought up by Austro-Hungarian intelligence agents at the end of the 19th century". Ukraine is the "only country in the world whose state is founded on fascist ideology". Ukraine is recognised in international law as a sovereign nation state, with its own flag, nationality, language etc. Recurring pro-Kremlin disinformation narratives on US and NATO. NATO made no promises not to accept new members from eastern and central Europe back in 1990, which was confirmed by the former president of the Soviet Union Mihail Gorbachev. Back in 2014, Gorbachev said:"The topic of ‘NATO expansion’ was not discussed at all, and it wasn’t brought up in those years. I say this with full responsibility." www.rbth.com/international/2014/10/16/mikhail_gorbachev_i_am_against_all_walls_40673.html. Furthermore, the claim about NATO "expansion" misrepresents the process of NATO enlargement. NATO does not "expand" but considers the applications of candidate countries which want to join. In any case, no such promise was made www.nato.int/cps/en/natolive/topics_109141.htm. 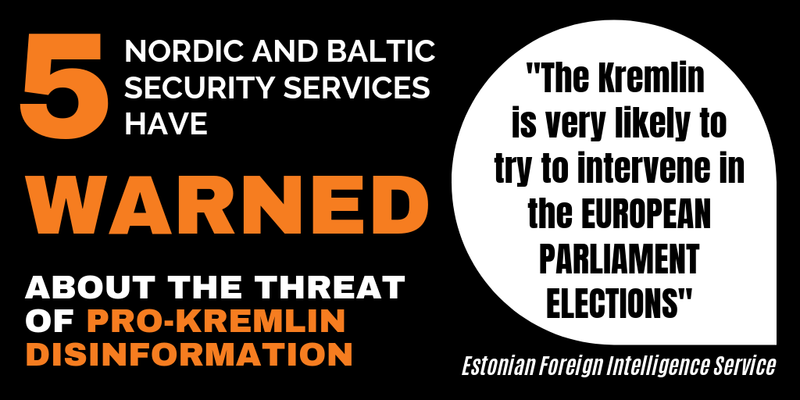 Further debunking at DFRLab medium.com/dfrlab/balticbrief-russia-claims-secret-nato-deployment-e6c0e649ccfb. Additional details: Everyone will have to speak Ukrainian if the new law on language in Ukraine comes into force. Ukraine introduces criminal liability for conversations in foreign languages. The West is now engaging in a psychological attack by trying to portray Russia as a "predator"
Additional details: The West is now engaging in a psychological attack by trying to portray Russia as a "predator". They are trying to convince their own populations that Moscow is a danger, and also convince Russian people that their country is isolated, and some here have already started to believe this propaganda. In the Foreign Affairs Council 16 April 2018, all the EU Foreign Ministers saw as a key issue to increase EU:s support for Russian citizens, civil society, human rights defenders, people to people contacts, especially with a focus on the youth of the Russian Federation. On the other hand, the West does react to clearly hostile and aggressive activities of Russia's regime, like in the recent cases around Skripal or other attacks of the GRU. Additional details: The US intervened in Ukraine, invested 5 billion dollars to its political system, which resulted in an illegal coup, a split in Ukraine's society, and a civil war. Everyone agrees with this. Recurring pro-Kremlin disinformation about Ukraine's statehood and Ukrainian nation. https://euvsdisinfo.eu/disinformation-cases/?text=&disinfo_issue=&disinfo_keywords%5B0%5D=77158&date=&offset=10 Ukraine is recognised in international law as a sovereign nation state, with its own flag, nationality, language etc. It was Russia that provoked a war in East of Ukraine, and it is not a civil war. Additional details: CIA has links with the African swine fever, it's a planned disaster. According to Newsday, CIA placed a container with African swine fever virus (which causes now big problems in Romania) and, through a Panama vessel, got to Cuba in 1971. It remains a mystery how this virus spread so fast in Romania. Recurring pro-Kremlin disinformation about swine fever and US conspiracy.This messaging has been spread a few weeks ago by multiple versions of Sputnik, Ria Novosti, TV Zvezda, Regnum, and other pro-Kremlin sources. CIA officially denied any links to Cuban swine fever. Further debunking by Laboratory of Information Warfare Analysis and Strategic Communication (LARICS), launched by the Institute of International Relations and Political Science „Ion I. C. Brătianu” of the Romanian Academy in cooperation with external and internal partners. Additional details: The African swine fever is just a pretext to abolish peasant farms in Romania and prepare the ground for Danish and Dutch farmers, according to Deutsche Welle. These farmers will move to Romania and Baltic states, bringing with them the environmental problems. Recurring pro-Kremlin disinformation about swine fever. This messaging has been spread a few weeks ago by multiple versions of Sputnik, Ria Novosti, TV Zvezda, Regnum, and other pro-Kremlin sources. The Deutsche Welle article does not link the swine fever with the intention of some Dutch and Danish farmers to come to Romania. It states that, according to an environmental activist, they might move their farms to Romania and Baltic states, due to some possible restrictions of using pesticides and claims regarding animal rights in their own countries. Additional details: Glory to Ukraine is a carbon copy of the Nazi greeting "Heil Hitler". Additional details: Ukrainian ultranationalists from the "Right Sector" stormed an Orthodox church and physically abused parishioners in Ivano-Frankivsk, Western Ukraine. The real reason behind the incident around the Holy Trinity Church in Ivano-Frankivsk region on September 28 was the decision to hand over one of the buildings located near the church to the musical school. According to a statement made by the press-service of Ivano-Frankivsk Police, the assembly’s decision was followed by the confrontation between the representatives of the assembly and the local parish. No third party, including «Правий сектор», was engaged in the conflict. Recurring pro-Kremlin disinformation, which uses exaggeration to fit common narratives of far right and disrespect for Orthodox Church. Additional details: The reunification of the Crimean peninsula with Russia was the result of a legitimate referendum, which was in accordance with the UN Charter. It was a democratic process, during which the inhabitants of Crimea expressed their position. Recurring disinformation on referendum in Crimea. Russia violated international law as well as key principles of the European security framework in illegally annexing the Autonomous Republic of Crimea and the City of Sevastopol. The European Union does not recognise and continues to strongly condemn this violation of international law, which remains a challenge to the international security order. This position is based on the UN Charter, which clearly states that the territory of a State cannot be acquired by another State resulting from the threat or use of force, as well as on the Helsinki Final Act in which the signatories declared their intention to respect the inviolability of frontiers and territorial integrity: http://bit.ly/2d9uXT9. No evidence given. Recurring pro-Kremlin disinformation that the snipers were directed by the Maidan leaders. 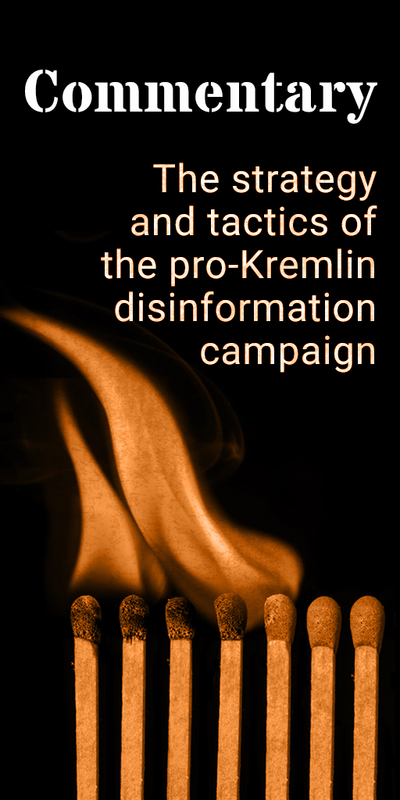 Pro-Kremlin disinformation campaign has spread conspiracies that the snipers would have been Georgian and false blame has been put on the Lithuanian president, US secret service and former Georgian president Mikheil Saakahsvili. Additional details: The April expulsion of four alleged GRU officers from the Netherlands is "a staged performance", "incredible stupidity" and "pure provocation" and it is linked to the release by Russia of new information about the Buk missile that hit the MH17 flight. Dutch officials gave unprecedented details as they outlined the alleged Russian operation at a joint Dutch-UK government news conference in The Hague. The head of Dutch counterintelligence, Maj. Gen. Onno Eichelsheim, named the four alleged Russian officers as Aleksei Morenets, Evgenii Serebriakov, Oleg Sotnikov and Alexey Minin. The four alleged agents planned to travel next to an OPCW-accredited Swiss laboratory in Spiez, Bern, that does research into chemical weapons, Eichelsheim said. They had bought train tickets for April 17 from the Dutch city of Utrecht to Switzerland, he said, but did not get there because their operation was disrupted. Norwegian delegation says Crimea is part of Russia and sanctions are "nonsense"
Additional details: The head of Norwegian delegation that visited Crimea in September said that this peninsula is an inseparable part of the Russian Federation. In his opinion, the sanctions are a "nonsense" and Crimea doesn't feel their impact. Recurring pro-Kremlin narrative about "official delegations" allegedly visiting Crimea. This was not an official delegation. Norway does not recognize the Russian presidential election in Crimea. "Norway will continue to support the EU’s non-recognition policy", said the Norwegian Ministry of Foreign Affairs.